Appearance: Ferrets are like the ones in our world except bipedal and they wear clothes. I'd imagine they have a bit shorter of bodies, as it doesn't seem possible for a ferret from our world to stand upright all the time. Diet: Ferrets eat anything, from meat to the vegetarian food most goodbeasts eat, although they prefer meat. Typical Personality: Ferrets are a more intelligent species of vermin - crafty and often cruel. They tend to be leaders in many vermin armies, or at least well up in rank. Appearance: Ferrets are long-bodied, slender, and lithe. They are about 15" to 19" long, including their 5-7" tail, and weigh around 3-5 pounds. Often they have a yellowish patch on their face, though the rest of their body is brown or dark brown. Life Span: Ferrets live up to 14 years. Diet: Most ferrets often raid rabbit hutches and chicken coops, though they also eat mice, rats, voles, and other such small rodents. 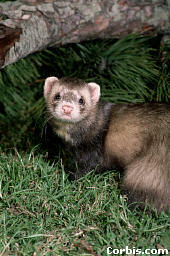 Habitat: Ferrets usually live in cavities under tree roots or in stream banks. They are mainly found in woodlands, farmlands, and wetlands. Typical Personality: Ferrets are playful, curious, and aggressive fighters. Habits: Ferrets are nocturnal. When they bite, they don't let go - ferrets lock their jaws and it's hard to get them to let go even after they die. They have strong musk glands used for both defense and as a warning to intruders. Life Cycle: Ferrets breed once a year between May and June, and have one litter a year of three to four pups. The pups are weaned after one month and leave their mother at three months of age. *Note: Polecats and ferrets have the same scientific name and are, indeed, extremely closely related. They often interbreed and the relationship between ferrets and polecats is similar to that between dogs and wolves, only closer. They are too closely related for there to be any need for two separate pages on polecats and ferrets.